Join the Branford Land Trust for a special Trail to Tavern event hosted by Trailblazer/Denali on Thursday, November 3, starting with an optional 5pm hike at the Red Hill Woods preserve, and a wine tasting provided by Votto Vines of Hamden from 6-8pm. This great night out, sponsored by Toad&Co, is open to the public and includes light snacks, a raffle, and free wine glasses for the first 50 people. A $5.00 donation gets you in the door. All proceeds benefit the Branford Land Trust’s Red Hill Woods/Spectacle Island fundraiser. Red Hill Woods is a stunning 29-acre parcel at the end of Red Hill Road, just north of 950 acres of protected open space currently protected by the Branford Land Trust, the Guilford Land Conservation Trust, and the Town of Branford. Spectacle Island, just a half mile offshore from Indian Neck, is a bare granite outcrop island west of the Thimble Islands. “Spec” is undeveloped and remains an active nesting area of several species of sea birds, and is a popular resting spot for migrating seals. To date, the Land Trust has raised more than $80,000 towards its goal of $200,000 to protect both of these properties. Attend the Trail to Tavern event to help us get closer to our goal! The 5pm walk at Red Hill Woods preserve, led by Matt Reed and Bill Horne, will be approximately one mile in length. Walkers should expect moderate terrain, with some sloping trails and inclines. Walking sticks welcome. To get there, take I-95 to Exit 56 and head south on Leetes Island Road. Turn onto Red Hill Road and continue past Van Wie Pond to the very end of the road. Park along the gravel lane. Walkers will have time to drive across town for the Tavern event at Trailblazer/ Denali, 1004 Main St, Branford. Trailblazer/Denali strives to develop, support and fund community outreach programs that promote youth and family engagement in the outdoors and to protect access to local green spaces. It understands that it is important to protect local green spaces not only as habitat for wildlife, but also as a place for all people to be able to get outside and enjoy nature. 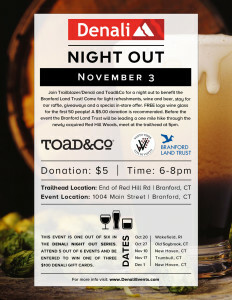 This is the second event it will host on behalf of the Branford Land Trust. For information about the event, call Trailblazer/Denali at (203) 458-1639 ext 208.